Knight’s Floor Mounted Rail Systems are designed to provide a safe, efficient solution to your ergonomic challenges. A wide range of options are available to meet all your specific engineering and application requirements. Our Suspension Rail Systems include an enclosed trolley track that resists dirt build-up for a smoother and quieter operation. Floor Mounted Rail Systems are available in single or dual bridge configuration. A Knight Representative will assist you in selecting and developing alternatives when designing your rail system. 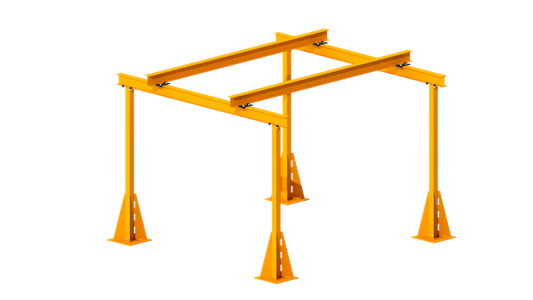 Suspends Knight’s RAD4110, RAD6110 and RAD7510 series workstation crane systems. Heavy Duty Steel Floor Mounted Post. 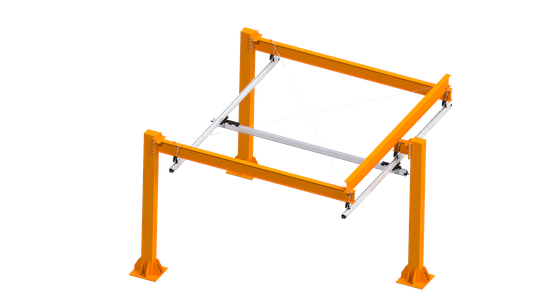 Available Heights: Up to 20 ft. [6m]. Designed specifically to your application and capacity requirements. 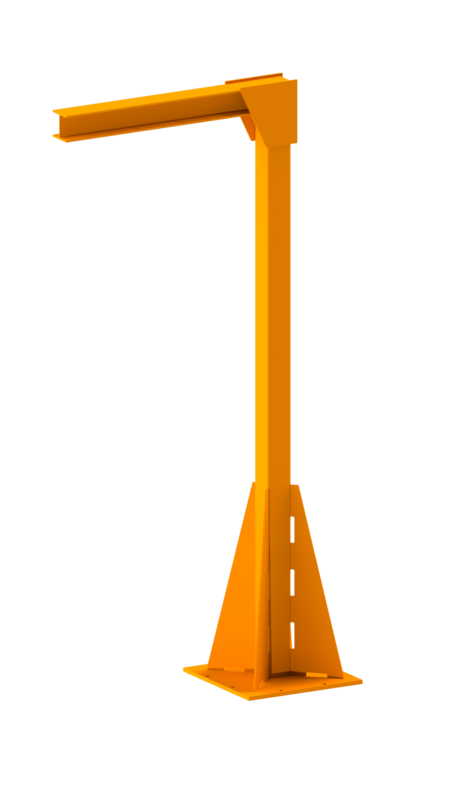 Maximum Column Height: 17 ft. [5181mm]. Maximum Beam Length: 23 ft. [7010mm]. 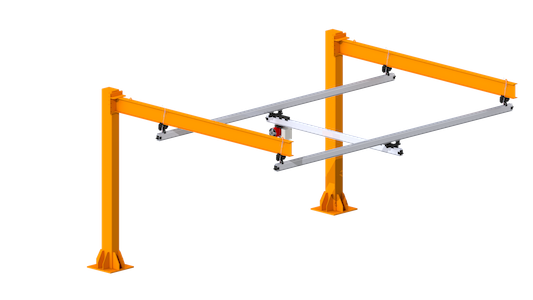 Rigid End Trucks to prevent skewing of the bridge and for precise loading and unloading operations. End-Caps with Shocks to absorb the bridge hitting the end of the rail. Extended Stack Hangers with 1.5 in. [38mm] of vertical adjustment in 0.25 in. [6mm] increments. Sway Cables with turnbuckles for adjustment. Integrated beam pad eyes to secure safety and lateral sway cables. Beam pad eyes assist in the lifting of the beam for assembly of the rail system. Maximum capacity varies by system requirements. See specification sheet for more information. Additional columns to minimize deflection. Requires Runway Rail Splice kit. Dual Cantilevered Rail System Configuration. Offset Three Post Cantilevered Rail System Configuration. Suspends Knight’s RAD4110, RAD6110 and RAD7510 bridges. Engineered Aluminum Cross Brace Supports. Max. Runway Length: 30 ft. [9144mm]. RAD7510 – 30 ft. [9144mm]. RAD6110/ RAD4110 – 25ft. [7620mm]. Max. Post Height: 12 ft. [657mm] (to bottom of runway). 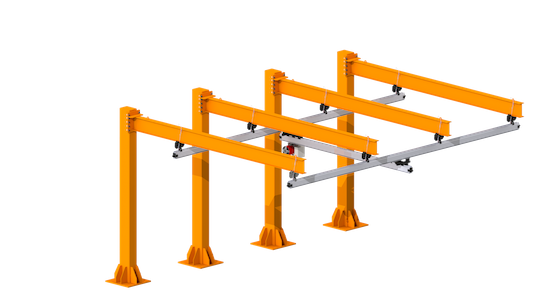 Posts no longer require welded construction which improves delivery time. Heavy Duty Steel Floor Mounted Posts. Designed for the use of W8 X 21 W-Beam. 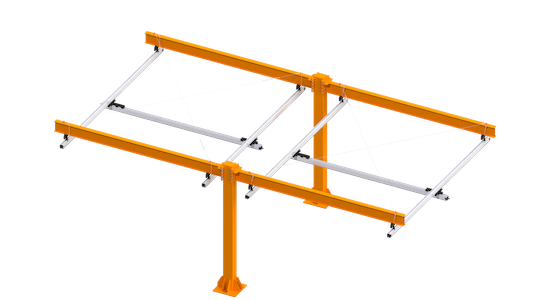 If other beams are used instead of W8 X 21 W-Beam, custom beam and post plates must be supplied. 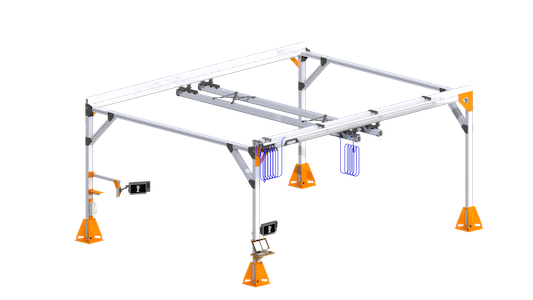 Efficient and economical solution when an existing overhead structure is not available to mount a workstation crane system.